So says Instapundit, surveying several recent articles and commenters, in this post. But I know that Mark Levin disagrees (he frequently refers to Rummy as his choice for "SEC DEF For Life"). I am someone with no personal military experience, but I have to say that I like him, too. 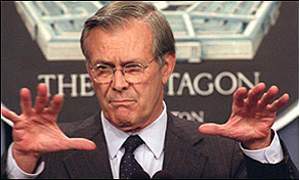 Instapundit gets some thoughtful letters in response to his post, some expressing support for Rumsfeld, others acknowledging the enormous complexity of his task. Read the critique on Rummy and felt it was not specific enough for me to judge whether or not he is performing well. It actually sounded like a lot of grousing I hear in corporate break rooms. No direction, Boss is sending me on a wild goose chase again, etc., etc. Pretty common comments in a dynamic environment. ("Grousing in corporate break rooms" - Now there's something I know about first hand!) Plus two participants in a Vanity Fair article feel they were misrepresented. The whole post is worth a read.